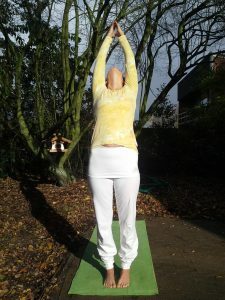 The benefits of Surya Namaskar, the sun salutation are an amazing part of the healing power of yoga, ranging from increasing circulation, lung capacity, flexibility, strength and digestion to relaxing the body and calming the mind, increasing concentration and ability to align chakras and balance doshas. you find its true meaning. that aligns your body with your mind and soul. The movement that unblocks your chakras and balances your doshas. For centuries Hindus have believed that sun, Surya is the creator and both the physical and spiritual heart of the world. Surya Namaskar, or sun salutation, is a prayer in motion to honour the sun, by performing a dynamic sequence of asanas or yoga poses. The purpose of performing the sun salutations is to use the body as an instrument for achieving a higher awareness and receiving wisdom and knowledge. 12 positions done in succession equal the 12 Sanskrit names for sun in all its positions in the sky and are often depicted in a circle. Each pose has its own matra and in often people site them while they perform this ritual. Although Surya Namaskar is considered part of yoga, it’s in fact at least 2500 years old and preceeds all modern forms of yoga practice. It has its origins in Vedas and is rich in symbols and mythology. Surya Namaskar is a Sanskrit word for sun salutations, a sequence of 12 yoga poses performed one after an other while practising deep yoga breathing. It is practised to recognise the sun as the source of life for our planet. It is performed every morning by millions of Indians, even though the never practice yoga otherwise and rather associate this with their Hindu religious practice. The 12 yoga poses that form the sun salutation give an amazing workout for your body and your mind. 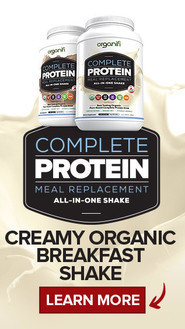 It is best performed in the morning, just after waking up, after a drink of warm water or tea and before eating. In the Western society, it is often performed at least few times in the beginning of a yoga lesson at a fast tempo to warm up the body in order to prevent injuries. Despite a common belief among the people who perform yoga for sport, it is not meant for a high speed exercise in order to burn calories. Yoga practise, including asanas and pranayamas is explained in detail in Yoga sutras, you can read about them in my article here: What is Yoga Sutras All About? Each of the asanas, or poses, have their own benefits and together they form an other unique set of powerful advantages. It works out all the muscles in the body and the deep breathing performed with the asanas empties the lungs of impurities. Performing the sun salutations and moving seamlessly from one pose to the other while practising slow rhythmic breathing also helps to align chakras and balance doshas. You always move with the breath, inhaling when extending and exhaling when folding. The breathing should be slow and controlled and last the whole duration of the asana. 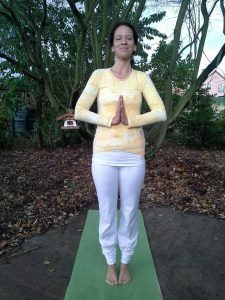 Prayer pose creates a sense of calm and relaxes the person, bringing the concentration to the surya namaskar. It is meant for a short moment of reflection and it is usual to close your eyes performing this pose. It is used for greeting in India, Sri Lanka and some other Eastern countries. It is normally followed by a nod of the head or a small bow, together with the Sanskrit word Namaste, which means ‘bowing to you or ‘the devine in me, bows to the devine in you’. To perform this asana, stand in the front of your mat, your toes touching each other, while the heels stay hip wide apart. Make sure your back is straight and your shoulders are pushed away from the ears. While facing straight forward, fold your arms from the elbows and bring your arms in front of your body, joining your hands and pushing them against each other, fingers pointing upwards. Raised arm pose stretches and tones the muscles, abdomen, while increasing the flexibility of the spine. It also expands the chest, helping to increase the intake of oxygen. This asana increases lung capacity and improves digestion. Lift your arms up and push them back, keeping your biceps as close to your ears as possible while breathing in deeply and looking at your finger tips. The idea of this pose is to stretch the whole body, all the way from the heels to the tip of your fingers. In order to deepen this pose, try pushing your pelvis forward and reach upwards with your fingers. Hand to foot pose, is a position that helps you to strengthen the legs and ankles. The deep stretch is especially good for loosening the hamstring muscle and opening the shoulders, arms and hip. To perform this post, bend from the waste while breathing out. Keep your spine erect and reach for the ground placing your hands to the ground. To deepen this pose bring the palms into the floor and push your chest towards your thighs. If you have problems of reaching the floor, you can bend your knees and try to straighten them little by little. Equestrian pose opens up your groin and hips, while stretching and toning your legs. It strengthens your waist, ankle and knees. It also lengthens the spine, stretching the chest. This asana is great for stimulating abdominal organs and releaves constipation, indigestion and sciatica. It also increases lung capacity and stamina. To perform this asana, while breathing in, step forward with your right foot, placing it between your two hands, while bending your knee and lowering our pelvis towards the ground and gazing upwards. To deepen this pose, push your hip towards the ground and stretch your neck and face upward and forward, while pushing shoulders down from the ears. The plan pose helps to strengthen wrists, arms and shoulders. It tones legs and abdomen. Plank also builds spinal strength, hence improving posture. This asana also improves stamina. To perform this asana, bring the left leg back next to the right one while breathing in. Bring the whole body into a straight line by firming your muscles and tightening your abdominal muscles and buttocks. Make sure you don’t let your buttocks sink nor rise, make sure your whole body is aligned from the heels to your forehead. The salute with eight parts enhance the flexibility of the spine and back. It also strengthens the back muscles. It has clearing effect on the mind and reduces tension and anxiety. To perform this pose bring your knees to the floor by exhaling. Bring your hips back and slide forward, resting your chest and chin on the floor. Push up your posterior keeping your toes in the ground. 8 parts; both hands, feet, knees, chest and chin touch the ground. Cobra pose has a great deal of benefits. It increases flexibility and stretches the chest, abdominal muscles and shoulders. It helps for lower back stiffness, while strengthening the arms and shoulders. The pose also firms buttocks. It also improves mood and invigorates the heart, while regulating menstruation for the ladies. To perform this pose, inhale deeply while you slide forward and lift up your chest like a cobra does when attacking. It i important to push your shoulders downwards, away from the ears. Your face should be bent upwards and your throat should be stretched. You may keep your elbows bent and bend your legs towards your buttocks. To deepen this pose, push your navel down and your chest forward. Mountain pose, also known as downward dog is a position that strengthens arms and legs. It also sends blood flowing into the spinal region and tones spinal nerves. To perform this pose, you need to breath out, lift your hips and tail bone and push your chest downwards creating an inverted V, a mountain posture. To deepen this stretch by pushing your heels into the ground, lift your tail bone and push down your chest. Equestrian asana is performed twice during the 12 poses of sun salutations. And 2 times during the whole set, which is 2 full rounds. The sun salutations start with right leg leading. So you push the right leg backwards while the left leg stays bent for pose 3. During pose number 9, the left leg stays back, while the right leg moves between the legs. On the second round you will lead with the left and do the opposite of the movements. Therefore it is important always to do an equal amount of sun salutations. Hand to foot pose is performed two times during surya namaskar. One of the biggest benefits from this pose is its ability to completely empty the lungs. 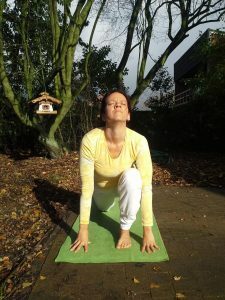 The aim is to gradually deepen this pose by bringing the wrist at the same level with the ankles and pushing the hands flat on the ground, while pushing the chest and the stomach towards the thighs. It is possible to perform this pose wit bent legs in order to lighten the stretch on the back of the thighs. Raised arms pose is also performed twice during surya namaskar. 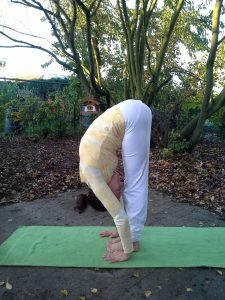 This pose is one of the basic back bends of yoga and is a simple and excellent way for increasing the flexibility of the spine, as well as loosening the stiffness of the shoulders and shoulder blads. Never force this pose, but instead imagine that you have a piece of string that is pulling you backwards. Only go as far as you get the feeling of falling backwards or you experience pain in your back or shoulders. Prayer pose is performed twice during surya namaskar. Use this time to bring yourself back to balance, to catch your breath and reflect on the poses you have just performed. Exhale, relax and feel the effects on your body and your mind before starting the next set. Correct your pose and check if you have moved backwards on your mat, step forward again, so you can stay on your mat. Do you hurry to perform surya namaskar as fast as possible, this is not the aim. Although it is good way to warm up before doing more advanced yoga poses, it is also an amazing moving meditation when performed slowly, savouring each breath and movement. It is the aim to gain the stamina by performing surya namaskar daily, to be able to participate for a celebration of 108, holy number in many of the Eastern religions, repetitions in one go at a slow pace. This is a typical event for yoga gatherings and Hindu celebrations where a guru is leading people and it can take up to 2 hour to complete. I can wholeheartedly recommend to do it at least once in your life time. I can guarantee you will never forget it. Happy I could teach you something. Yoga is a way of life and a path to life long learning. Surya Namaskar coupled with Pranayama can get rid of any kind of physical and mental illness. I have been doing this for some time and by anxiety attacka have come under control. Absolutely. It keeps you healthy and mentally fit. I’m happy you found it helps you. How is this compared to Ashtanga primary series? Hi Marina, Surya Namaskar is mostly used in Hatha yoga. It is much less physically demanding than Ashtanga primary series and also requires less flexibility and balaance. I loved your post about the benefits of surya namaskar! I read your blog fairly often and you always come up with great stuff! I really hope to see more of your insights to yoga. I shared this on my Scoop.it and my followers loved it. you are welcome, happy you and your readers enjoyed. I will try to write few yoga related posts every month. You state that these poses are very simple, but I will not be able to do most. 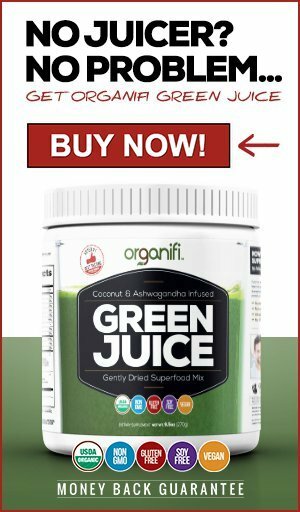 Are there alternatives? Yes. Each asana has variations to make surya namaskar easier if you have physical limitations or are too unflexible for the full movement. You can advance to the full execution with time. I would suggest you seek out a qualified instructor in your area and ask for few private lessons to get started. Facebook and my followers loved it ! Keep up the good work ! Hi Jesus, thank you for the positive feedback and shares. Very interesting to hear about the benefits of each yoga pose. I see in our profile that you are an ayurvedic yoga teacher. How is ayurvedic yoga different from normal yoga? Great question! Ayurvedic yoga supports ayurvedic remedies and diet in order to correct certain imbalance in doshas that causes illness and discomfort. Basically after the ayurvedic analyses for the problem, a specific yoga program is generated with the assistance of a qualified ayurvedic yoga instructor. I think this is very interesting. Yoga seems give so much benefits that I really should get started with it, but been unsure how to. I have now found a studio near me that teaches Hatha yoga, I hope I can learn this routine and start a daily practice. Thank you for giving me the courage to get started! Hi Travis, yoga has enormous amount of benefits, doesn’t matter if you are just getting started, or if you are a guru! I am happy you have been able to find a good Hatha yoga studio, surya namasar will absolutely be part of their warm up routine and you will learn it no time. Hi there, just became aware of your blog through Google, and found that it’s really informative regarding to yoga and ayurveda. Numerous people will be benefited from the information you provide. I always admired the simple yoga routines people in India practiced outside the temples in their normal clothes and not in some tight yoga attire! Cheers! Hi Virgil, I am happy that you find my article useful. Most people in India practise yoga in typical loose clothing, tight fitting yoga clothes are a Western invention. Namaste Allen! Yes, my name means Ocean! It gives me great pleasure that you enjoyed my article about the benefits of surya namaskar! You are right, yoga is all about the balance of body, mind and soul and not a flexibility contest. Usually I don’t read long articles on blogs, but the benefits of surya namaskar forced me to do so! I love the pose per pose approach by listing the benefits, plus the ones gained from the regular practise, instead of just a short blurb. I learned so much as now understand better why yoga has transformed my life. I will aim to the sun salutations into my daily routine, might not manage daily, but hopefully at least few times a week! Hi Leif, I am happy you enjoyed my post about the benefits of Surya Namaskar! Yoga is great for everyone and practising sun salutations even few times a week will surely give you many benefits! I love this post and the whole blog. You have shown that one doesn’t have to be overly flexible and bend in all sorts of weird guru poses to benefit from yoga, but just performing Surya Namaskar right every day has enormous benefits. I live in Keerbergen, Belgium and have my own beaty studio. Would it be possible for you to visit and give me my sister private yoga lessons and disguss also the possibility of you guiding us with kansa wand massage therapy? Hi Liesbeth, you are right that yoga teachers often try to convince you that more complicated the asana, the more it will benefit you. Not so, daily practice of a basic yoga routine such as Surya Namaskar will benefit you in so many different ways! Yes it is, I have sent a private email. Wow, great read! I have actually seen Surya Namaskar being practiced when I was living in Singapore. I worked in the shipyard and we had a temple inside the yard for our Indian workers and we would see them as we went past. I have to admit I’m not really au fait with the 12 yoga poses but I love how you have a photo for each one in your review. Hi Craig, yes Surya Namaskar is a long tradition among Hindu people, even if they don’t otherwise practice yoga. Thank you for your compliment regarding my asanas, I wanted to add the pictures, as the proper alignment is important for the full benefits. Surya Namaskar is a vedic ritual around 11000 years old. Hindus worshipped sun “the one who illuminates our minds.” Do you know yoga sutras? Hi Aryan, than you for quoting yoga sutras! As a yoga teacher I am aware of the text and am planning on writing an article in this topic. Yes, roots of yoga and the Surya Namaskar are in the Vedic times although the exact date can’t be pinpointed and often scholars are arguing about the exact form of the sun salutations as the 12 positions of the sun are depicted in different ways in the many variations. This article really gets to the essence of yoga and the Surya Namaskar. I have Indian roots and am absolutely disgusted with what the so called yoga studios here at Texas call yoga. It’s all just a sweaty flexibility contest and if you can’t keep up with the pace, the instructors tell you to shape up, not to even talk about the fact that they are not able to perform the asanas correctly themselves. I practice yoga only home with family, because I haven’t found a proper place anywhere withing 2h drive. Hi Andrew, you are right, most of those places can’t call themselves yoga studios. It’s a sign of a bad yoga instructor if they try to force you to practice in a way that you are not comfortable with or their body is not redy for. This is the reason why yoga can be dangerous. Home practice is good, but not ideal to do it always alone, as good yoga practise also includes energy exchange. Maybe you can start your own group with other same minded individuals? You could look at the internet or put a notice somewhere? 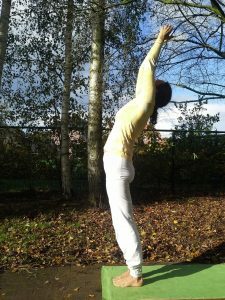 I have seen your article ‘The Benefits Of Surya Namaskar – Yoga Healing’ featured on the yoga journal and wanted give you compliments on your writing and the wonderful graceful ways you execute your asanas! I myself have a long way for such perfection. I start my day with Surya Namaskar and go to a Hatha yoga class twice or three times a week at a small studio. Our practise is not too dynamic, but rather spiritual and I simply love it. Hi Wolfgang, I wasn’t aware that my article was featured in Yoga Journal, but it explains the sudden increase of traffic to my blog! Thank you for letting me know. I don’t believe my yoga asanas are perfect, but I have had help from a wonderful guru to assure that I execute them correctly, which is very important for proper practice. Surya Namaskar is a wonderful start for a day! Yoga will benefit you in many ways as doesn’t have to be overly dynamic. You should do it at the pace that suits you and your needs best. Hi Mira, this is really a wonderful article. I think too many yoga studios have popped up today, who are just teaching yoga as a method to get fit. They have no idea of the philosophy and the origins of yoga. At the first yoga studio I checked out here in Frankfurt they were selling sports drinks! Now I have found a place called Yoga Vidya and simply love them. Spiritual Hatha yoga! Hi Andrea, you are right, not many yoga studios teach what could be called yoga, but rather sport. I know yoga vidya well, as I have enjoyed a 3 week retreat at their place in Bad Meinberg myself and absolutely loved the silent Shivalaya retreat. I’m happy you have found them as they really put emphasis on the spiritual side of yoga. This is a fantastic article! I don’t think I am quite that flexible to be able to pose in some of the positions that are shown here! Especially Hasta Padasana, now I can bend over obviously but getting my palms on the ground would prove challenging. I am doing regular exercise now however and I am eating way better too. I should add some light yoga to my daily routine to help speed up my weight loss. I did do some yoga a few years back in an exercise program I was doing and I swear the yoga was the hardest section along with the longest! Again fantastic post you really put your all into everything you write and it shows Kudos to you, lady! Hi David, happy you enjoyed my post. There are several ways to make the poses less intense. I am only showing the asanas fully performed for reference reasons, but not even many yoginis are not able to perform them to full extend. A good teacher will be able to guide you into a gradual way of deepening the poses. Yoga is hard for the muscles, because the poses are held for long time. Yoga will definitely help you to loose weight as it will increase your muscle mass. My mornings have begun with sun salutations for the past 15 years. It has changed me in ways I cannot describe. My spine has become more flexible, my arms stronger, my breath deeper and my mind calmer. Also, my digestion has greatly improved as a result. The practice is relatively easy to learn, but the results are so profound. Thanks for sharing! Hi Jackie, thank you for sharing your story with me! I agree 100% I only missed my morning ritual few times the last 28 years when I have been really ill or somewhere with no physical space, such as aeroplane. The practice really does make a huge difference for the body, mind and soul. I love how you’re such as expert in Yoga. Your articles are ALWAYS well informative and to the point. And this one is no different! That’s really interesting that Surya Namaskar is over 2500 years old. And my favorite pose would have to be the prayer pose since it looks so easy AND you gain a lot of benefits just from doing that one alone. thank you for your kind words. It’s good to know that people find my articles interesting. The prayer pose is good, but the benefits are optimized when performed as part of the Surya Namaskar. Great guide for Surya Namaskar! I’ve heard about it before but never tried it. A few years ago I’ve practiced yoga in daily life system for a few months and then stopped because I’ve started serious strength training (squats, deadlifts etc) and simply don’t have enough time for both. But I always do Khatu Pranam almost daily to stretch the muscles, loosen the joints and speed up the regeneration. Do you think I would see any benefits of doing both Khatu Pranam and Surya Namaskar, since many of the poses are the same? Hi Marek, thank you, happy you enjoyed my article. Khatu Pranam consists of 10 poses is dedicated to Bhagwan Sri Deep Narayan Mahaprabhuji. Do you or your family originate from Rajastan, or did you just pick the practice up at the holistic yoga studio? Many of the poses are the same, but the pace is different, so I would say both have their benefits. I believe Surya Namaskar is little bit more dynamic, so it’s great for performing in the morning. No and no 🙂 It’s recommended in the Yoga In Daily Life system. I’ve bought the book after reading some good reviews about the system. Aha, makes sense, yes, it’s a great system. Wow! great article. I love learning new things about yoga, the history of the sun salutations is very interesting. I love Yoga but I am more of a beginner and I always thought that sun salutations were just a warm up for yoga classes! I will definitely be looking further into this. Thanks! It’s great that you learned something about my article, it gives me pleasure to share my knowledge with others. Many people new to yoga don’t realise there is much more to yoga than just sport. Some people don’t want to know, but those who seek the knowledge will have a whole new world opening up for them. Yes, yoga heals and surya namaskar is a great way of practising yoga daily. Nice posture in every asana. Good article. Hi Mira, happy to know you agree with me about the importance of Surya Namaskar and the healing effects of yoga! It’s nice to get so much good feedback from someone with your background! As a yogini I loved reading about the deeper meaning of surya namaskar and benefits of each and one of the asanas. The pictures are great too, as is the recommendation to learn it from a professional and not a random Youtube video. Hi Diana, it’s great that an experienced yogini finds something useful in my article. You are right, random Youtube videos are certainly not a way to go when one is looking for reliable way of learning the basic yoga asanas!